The words Client and Customer seem pretty clear cut, but in real estate they mean completely different things to a Realtor®. These two words and how they relate to the Realtor® as individuals make an important difference in the type and level of service you receive. Please take a few minutes to read, and after reading you will fully understand what the major difference is, you will know then which one you want to be. When listing your home for sale with a Realtor® you are required to enter into a written contract. This is due to the time and expenses incurred by the Sales Representative and Broker, who will not be paid for services rendered until the closing of the home. The real benefit, however is for the home owner. After a contract is entered into the sales representative has a fiduciary responsibility to get the highest price possible, and to protect the Seller’s interest above all else. You, the home owner are now a “Client” and can experience the full privileges of a close working relationship with your Realtor®. Your interests are now first and foremost. This enables your Realtor® to market your home, network with other Realtors® to find a Buyer. We will also negotiate the sales contract and guide the Seller to a successful closing. In addition, is also protects the agent from home owners who wish to benefit from services provided, without compensating the professional doing the work. 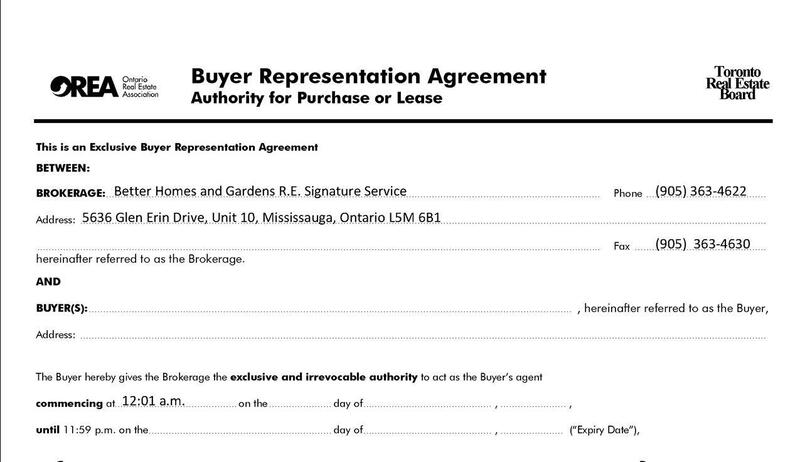 In the past, Buyers have worked with Realtors® too, but because of abuse to Buyer’s agents and increased customer awareness, Buyers are now asked to enter into a “Buyer Representation Agreement.” Without this contract the sales representative was particularly vulnerable to working without getting paid. Often Buyers would ask the Realtor® to show them numerous properties, where the Realtor® invested time and expense in doing so, and the Buyer then uses another Realtor® to purchase their home. Buyers also soon realized that, without a signed Agreement with their agent, at the negotiation table the Realtor® was actually working for the Seller, not them. They did not have a true advocate to represent their interests with a contract, and the only way to protect their interests was to create a binding agreement that protects both parties. Despite these advantages, some Buyers are still reluctant to sign as they don’t want to feel they are being be “tied down” to one agent, or they mistakenly think that getting several Realtors® to work with them, will get them a better home or deal. This is not the case as part of the strength of the industry is the Realtor® communication network… a Buyer working with several sales representatives will quickly be revealed and will not taken seriously by the Realtor. Many Buyers believe they must enter into an Agreement for a long period of time. This is not the case at all. The contract can be for any length of time , i.e. one week, one month, three months, etc. It can also be specific about the type of property, i.e. commercial, residential etc. Without a contract the Buyer is clearly not a “Client”, but a “Customer. ” When a good listing comes on the market that would be suitable to the Buyer, who do you think the Buyer’s agent will notify first? The uncommitted Buyer (the “Customer” who hasn’t signed a contract), or the “Client” the contracted Buyer? Which one do you think the agent will work harder for. Who will the agent put forth their best efforts for in finding them their next home? In reality, the Buyer has no protection without a contract. Anything they say to an un-contracted Realtor® may be passed along to the Seller. Why? Because any Realtor® who works for the Buyer without a contract automatically becomes a sub-agent for the listing broker, and is therefore working on behalf of the Seller. Surprised? 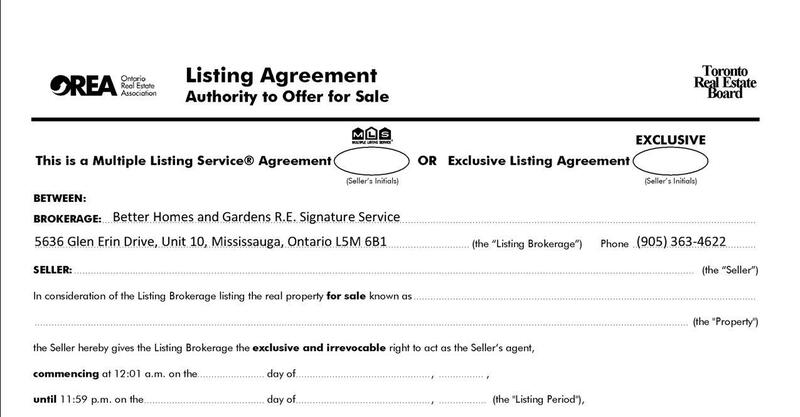 Its all there… in the Listing Agreement and in the Buyer Agency Agreement. an advocate representing you and not the Seller? to work with a Realtor® who will protect your interests? Do you want to be taken as a serious Buyer? to receive the level of service you expect and deserve from a Realtor®? I live and work in STREETSVILLE and have a vested interest in property values here. Are you considering buying or selling or know anyone who is? Give me a call (416) 717-6331. When you choose me to handle your real estate needs, you are choosing a real estate professional who cares about you and your family. I am an agent who will listen to your needs, and work together with you. As a professional agent with integrity, I will protect your interests to achieve your objectives.